Hey Microsoft... It's time you accept the fact that XPS didn't catch on, and offer PDF instead. So you just bought a brand new Windows PC, and one of your first tasks is to send a client a PDF of your proposal. 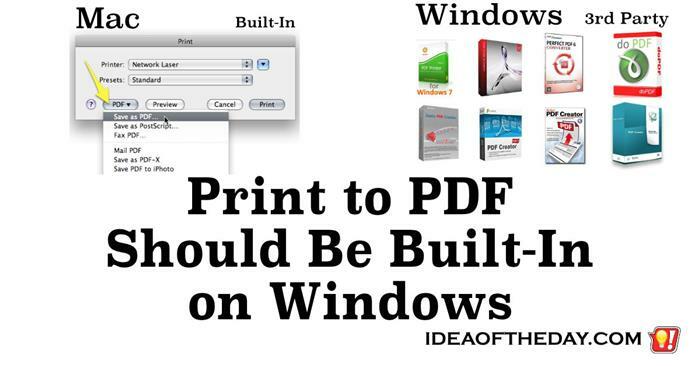 But wait... there's no built-in option to print to a PDF. This means that only some of your programs can create PDFs. Microsoft was nice enough to give you an option to create an XPS file, but the fact is, nobody cares at all about XPS files. PDFs are the industry standard in document sharing.